Throughout history and still, throughout much of the world, people have created shelter using their own hands and the materials available around them. Communities would come together and amidst families, singing and good food, homes would be built. We were inspired by these traditional ways as well as the efforts of many modern world self-help builders. When the time came that children were on the way and we needed a home for ourselves, we set out to create shelter in this way. We soon learned that for a couple of thousand pounds, we could take healthy natural, and salvaged materials we could create modest scale dwellings that meet our needs and are more cosy and beautiful than anything we could buy. Whatsmore, we could use simple techniques, get help from friends and all have a jolly good time doing it. Being your own (have a go) architect / builder is a lot of fun and allows you to create and enjoy something which is part of yourself and the land rather than, at worst, a mass produced box designed for maximum profit and convenience of the construction industry. Building from natural materials does away with producers profits and the cocktail of carcinogenic poisons that fill most modern buildings. The buildings we have made are part of a low-impact or permaculture approach to life. This sort of life is about living in harmony with both the natural world and ourselves, doing things simply and using appropriate levels of technology. These sort of low cost, natural buildings have a place not only in their own sustainability, but also in their potential to provide affordable housing which allows people access to land and the opportunity to lead more simple, sustainable lives. 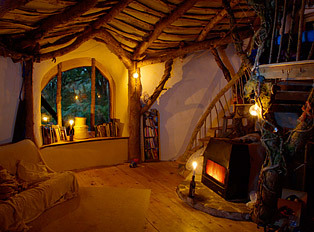 For example the hobbit house was made to house our family whilst we worked in the woodland surrounding the house doing ecological woodland management and setting up a forest garden, things that would have been impossible had we had to pay a regular rent or mortgage. To read more about why this is an important option to meet the challenges of climate change and peak oil, click here. 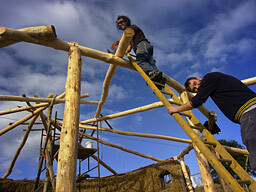 Would you like to learn more about this sort of building and gain practical experience? Why not join us on another exciting building project. There will be opportunities for everyone of all abilities and areas of interest. Click here for more details. This website includes two of the family homes we've made, the Hobbit House and the Undercroft, as well as other building projects by us and other people.